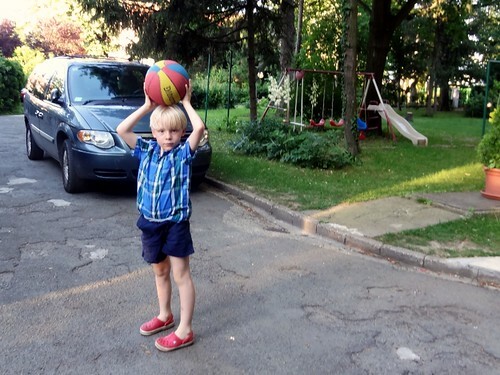 Oliver, Ocean and I played a bit of basketball last night. Ocean was not feeling well yesterday, she picked up a virus from her nursery school and was vomiting all day. She finally perked up in the evening. Owen was on a sleepover, so Ollie and I hung out last night. I am reading “The Curse of the Titans” a book by Rick Riordon in the Percy Jackson series. Ollie is quite enjoying it. It was a sad day as well yesterday as Owen said goodbye to his friend Devin. That is one bad thing about international schools is people in your life come and go quite quickly. This is the first really good friend Owen has had, so I was interested in his reaction. 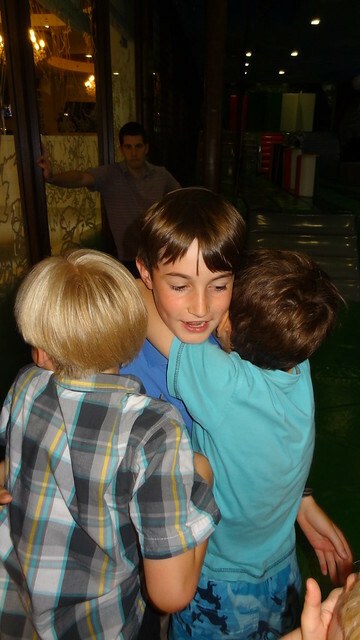 He was quite good about it, giving Devin a big hug before leaving his party. I really hope to keep in contact with Devin and his family. They will be in Slovakia next year which is not that far away. Weather was in the 90’s yesterday and I am loving the summer! We are getting ready to host a BBQ today.